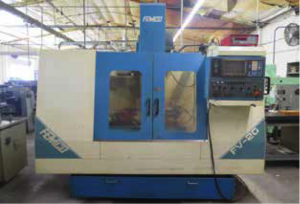 1997 Femco FV-20/VC-V650B CNC Vertical Machining Center s/n V970106.C w/ Fanuc Series 0-M Controls, 20-Station ATC, CAT-40 Taper Spindle, 6000 RPM Spindle, 17 ¾” x 39 ½” Table, Coolant. Hitachi Seiki VA-50 4-Axis CNC Vertical Machining Center s/n VA- 5176 w/ Fanuc System 6M Controls, 20-Station ATC, CAT-50 Taper Spindle, 28-3150 RPM, 19 ½” x 63” Table, Coolant, Tsudakoma RNCM-300R 4 th Axis 12” Rotary Head s/n 205089 with 8”6-Jaw Chuck and Center. Hitachi Seiki HiTec-Turn HT-20 CNC Turning Center s/n 21013SC w/ Fanuc 11M Controls, 3600 RPM, 12-Station Turret, Hydraulic Tailstock, 8” 3-Jaw Power Chuck, Coolant. Hitachi Seiki 4NE-600 CNC Turning Center s/n NE-41405 w/ Fanuc System 6T Controls, 12-Station Turret,Hydraulic Tailstock, 10” 3-Jaw Power Chuck, Coolant. Bridgeport Vertical Mill s/n 183861 w/ Acu-Rite DRO, 2Hp Motor, 60-4200 Dial Change RPM, Ultron Snap-Change Power Draw Bar, Power Feed, 9” x 42” Table. Bridgeport Vertical Mill s/n 116767 w/ 2Hp Motor, 60-4200 Dial Change RPM, 9” x 42” Table. Bridgeport Vertical Mill s/n 40408 w/ 1Hp Motor, 80-2720 RPM, 8-Speeds, Power Feed, 9” x 42” Table. Monarch mdl. 10EE 12 ½” x 20” Tool Room Lathe s/n 28905 w/ 2500 Max RPM, Dial RPM Gage, Inch Threading, Tailstock. Monarch mdl. 12”-C 14 ½” x 30” Geared Head Lathe s/n 7688 w/24-1000 RPM, Taper Attachment, Inch Threading, Tailstock, Steady Rest, KDK Tool Post, 12” 4-Jaw Chuck, 11” 3-Jaw Chuck. Hardinge mdl. HC Hand Chucker s/n HC-876-B w/ Threading Attachment, 125-3000 RPM, 8-Station Turret, Trava-Dial, Power Feeds, 5C Collet Closer, Coolant. Hardinge mdl. HC Hand Chucker s/n HC-5818-T w/ Threading Attachment, 125-3000 RPM, 8-Station Turret, Power Feeds, 5C Collet Closer, Coolant.Hardinge mdl. HSL Speed Lathe s/n HSL-5C-263-A w/ 3-Speeds, Compound Cross Slide, 5C Collet Closer,KDK Tool Post. Sheffield mdl. 110B Hydraulic Multi-Form Crush Grinder s/n 400530 w/ 3” Form Cap., Sokki DRO,Northfield 4” 3-Jaw Pneumatic Chuck on Work Head, Tailstock, Coolant Filtration System, Smog-Hog Industrial Air Cleaner. Sheffield “Crushtrue” mdl. 110B Hydraulic Multi-Form Crush Grinder s/n 5-0171-570 w/ 3” Form Cap.,Northfield 4” 3-Jaw Pneumatic Chuck on Work Head, Tailstock, Coolant Filtration System, Smog-HogIndustrial Air Cleaner. Sheffield mdl. 110B Hydraulic Multi-Form Crush Grinder w/ 3” Form Cap., Motorized Work Head,Tailstock, Coolant Filtration System, Smog-Hog Industrial Air Cleaner. Sheffield mdl. 22VA Microform Grinder s/n 5-0323-1172 w/ Sony DRO, Taylor Hobson Viewing Scope,Compound Grinding Head, Motorized Work Head, Tailstock, Pantograph Attachment. BrowN & Sharpe mdl. 13 8” x 22” Universal and Tool Grinder s/n 525-13-1993 w/ Acu-Rite DRO,Motorized Work Head, Tailstock, Adjustable Headstock, Coolant. Brown & Sharpe mdl. 13 8” x 22” Universal and Tool Grinder s/n 525-13-1178 w/ Acu-Rite DRO,Motorized Work Head, Tailstock, Adjustable Headstock, Custom Automatic In-Feed Unit, Coolant. Brown & Sharpe mdl. 13 8” x 22” Universal and Tool Grinder s/n 525-13-1305 w/ Motorized Work Head, Tailstock, Adjustable Headstock, Custom Automatic In-Feed Unit, Coolant. Brown & Sharpe mdl. 13 8” x 22” Universal and Tool Grinder s/n 525-13-205 w/ Acu-Rite DRO,,Motorized Work Head, Tailstock, Adjustable Headstock, Custom Automatic In-Feed Unit, Coolant. Landis Type IR 10” x 20” Universal Cylindrical Grinder s/n T88459 w/Automatic Cycles, Motorized Work Head, Tailstock, Coolant. Brown &; Sharpe mdl. 5 4” x 12” Automatic Universal Cylindrical Grinder w/ Motorized Work Head, Tailstock, Coolant. Cincinnati mdl. 1 Centerless Grinder s/n 1M4H5T-12. Sunmax SGS-1024AH 10” x 24” Automatic Hydraulic Surface Grinder s/n 501237-1 w/ Sunmax Controls, Auto Cycles, 10” x 24” Electromagnetic Chuck, Wheel Dresser, Coolant. K.O. Lee 6” x 18” Automatic Hydraulic Surface Grinder s/n 17421-GL w/ 6” x 18” Fine-Line Electromagnetic Chuck, Coolant. Jones & Shipman mdl. 540 6” x 18” Automatic Surface Grinder s/n 318-W-167 w/ 6” x 18” Magnetic Chuck, Coolant. Sunnen mdl. MBC-1804 Precision Honing Machine s/n 91128 w/ Power Stroking Attachment, Squaring Arm, Coolant. Sunnen mdl. MBB-1600 Precision Honing Machine s/n 44339 w/ 12-Speeds, Sunnen Coolant Filtration System. Sunnen mdl. MBB-1600 Precision Honing Machine s/n 41542 w/ 12-Speeds, Coolant. 2007 Atlas Copco GA22FF 30Hp Rotary Air Compressor s/n AP1452008 w/ Elektronikon I Controls,Zander EcoSep SL5 Oil/Water Separator, 240 Gallon Air Storage Tank. Wells Saw mdl. 1000 10” Automatic Horizontal Band Saw s/n 2144 w/ 4-Speeds, Manual Clamping,Automatic Feeds, Coolant, Conveyor. DoAll “Metal Master” 16” Vertical Band Saw w/ Blade Welder, Dial Speed Indicator, 24” x 24” Table. Enerpac 50 Ton Electric/Hydraulic H-Frame Press. BlueM mdl. CW-7780F 704C/1300F Oven s/n FI-00013 w/ Digital Heat Controls, Chart Recorder. BlueM mdl. POM7-256C 343C/650F Oven s/n P38-1079 w/ BlueM Controls, Chart Recorder. (2) Burgmaster 6-Station Turret Drill Presses. Enkoh’s Bench Model Drill Press. Hamilton Tool Table Model “Sensitive” Drill and Tap Machine. Smog Hog mdl. SG-4S-H Ceiling Mounted Industrial Air Cleaner s/n 60032049-0198. (2) Trinco mdl. 36/BP Dry Blast Cabinets w/ Dust Collectors. (25) Ultron Snap-Change R8 Draw Type Taper Tooling. Hardinge Narrow Bed Compound Cross Slide. Sunnen Tooling Cabinet w/ Mandrels, Shoes, Stones and Truing Sleeves. (35) R8 Tooling and Collets. 5C and 3J Collet Noses (HITACHI SEIKI LATHES). 3J and (2)5C Speed Chucks. (2) 6” 3-Jaw Chucks (HARDINGE). 3” 3-Jaw Chuck w/ 5C Adaptor. 8” 3-Jaw and 8” 4-Jaw Chucks. 7” x 8” Compound Side Table. Asahi 19” x 33” Bench Center. 5” x 9” Bench Center. (2)Hardinge 5C Indexing Heads w/ Tailstocks and Fixture Bases. (4) Hardinge 8” x 12” Bench Centers. Foredom and Dremel Flex Shaft Grinders. Large Quantity of Carbide Crush Rolls, Grinding Wheels, Repair Parts and Acces. Insert Milling, Turning and Boring Tooling, Carbide Inserts, Drills, Taps, Reamers, Carbide and HSEndmills and Perishable Tooling. J & L mdl. PC-14 Floor Model Optical Comparator w/ 6” x 30” Table and Acces. 2005 Starrett mdl. 3814 Analog Hardness Tester s/n 7902.